Well it's getting the that time again. The leaves are changing colour, we've had some Autumnal showers and gale force winds and the odd day that suggests Summer hasn't quite left the building. My golf season has busy in the last few weeks both at my club, Royal Ascot and out and about. The car crash holes remain and mentally I remain poor and make too many poor decisions, have poor pre-shot routines and don't seem to have any resilience. Technically, I had a lesson recently and worked hard on turning, not sliding the hips, which is beginning to get the shaft flatter and I am making some good strikes. It's a work in progress and something I'll be taking into the winter. Last Sunday (24th) I played in a club match at home to Caversham Heath. The club had played the away game earlier in the season and were 4-2 down. I was partnered with a six handicapper, Shaun Franklin who is a great ball striker and always competitive. We were up against a 20 and 17 handicapper and if I tell you Shaun was +2 gross after nine and I was only one over my handicap and yet we were three down you can see what a fickle game match play can be. To our credit, Shaun and I battled hard. He won the tenth and I won the eleventh and made birdie at the par three thirteenth and suddenly it was all square. We had chances to take a lead but squandered them and went one down at the seventeenth. With both the opponents getting a shot at the last a par was a minimal requirement. Neither of us hit good tee shots but we were helped when one of the Caversham pair lost a ball. Shaun had to lay up and pitched to twelve feet for his fourth. The other Caversham player had also come up short and was faced with a tough pitch over a pond, in front of a packed patio with both sides looking on. To his credit he got it over but had a twenty five foot putt. He'd not had great distance control all day and with the putt downhill and left to right we were still alive. I had managed to hit my second forward and left 184 yards. Normally I wouldn't take it on but I had too and hit an ugly five wood pin high and had putted down to two feet. I was hoping for an opening from our opponents but sadly he managed to finally find a putt of note and hit it cosily to a foot. We conceded and we lost one down. I have to thank my partner who played well throughout but gave too many shots to two golfers playing well. It happens but he kept plugging away and I tried my hardest to stay in each hole and give him support. Fortunately Royal Ascot had secured a 4-2 win on the day which meant after the home and away games, it was tied 6-6 and so Royal Ascot retained the trophy. Other than that, I played in a Golf Monthly Forum Help For Heroes charity day at the wonderful Hanckley Common Golf Club and will be doing a full course review very soon. As you will know if you're a regular reader I qualified for the end of season "Masters" having won the Centenary Medal earlier in the season. Two rounds of medal play that didn't go to plan. Still, it was the first time in a few seasons I'd qualified and my 24th place wasn't a total disgrace. Elsewhere I've enjoyed the normal fun associated with being a golf club member and playing in regular roll up events. My form is still patchy both in social games and in competitive rounds. As I've mentioned the handicap is back to where I started. Where does that leave "The Quest For Single Figures"? I feel my 2017 has actually been half decent. I won a competition, had a second place and have managed to play some new courses. I've managed to get my Youtube channel up and running and have enjoyed producing some content, particularly the product reviews which have been getting some great comments and views. If you've missed the channel (and I've not been subtle pushing it) you can look at it here (Three Off The Tee Youtube Channel). Sadly, it's come to that time of the year when I can't get to the club and get nine holes in and there's only about an hour and a quarter, ninety minutes at most, to work on my game. Autumn is here and the chance to get out after work and use the club facilities in the week is diminishing. That means it'll be the range again for me and everyone else. However at least the course remains in fantastic condition and so weekend rounds are still something to look forward to. We'll soon have laves lying on the ground to contend with, and no doubt the odd ball or two will disappear without trace. Such are the joys of golf in the UK in the Autumn. Mind you from there we go to winter and sodden or frozen courses, temporary greens and the chance of closure through flooding and snow. Let's enjoy what we have now. I have some ideas on what I want to do over the winter to improve my game and get "The Quest" up and running again. I've spoke about NLP (neuro-linguistic programming) and basically finding a way to think better on the course and make better choices. It's an area I've wanted to work on for a while but its something that's drifted onto a back burner. I've been give the name of the Head of Academy at Windlesham Golf Club, Lee Mucklow who specialises in NLP (Lee Mucklow Profile). I am actually very happy with the teacher I've been using and don't really want to confuse matters getting swing tuition from different sources so I need to discuss my needs with Lee and see what he has to offer. 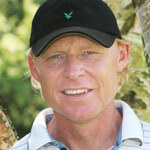 Lee Mucklow - Head of Windlesham Golf Club's Academy and an NLP guru - Can he get my game and mind working? Going forward I want to work on my Youtube channel and get some great content up. I've a lot of ideas and plans but things really open up once I hit 100 subscribers and I'm tantalisingly close and in the mid 90's. If you haven't subscribed, please go ahead and do so. It's free. Once I hit 100 subscribers not only can I give away the prize from my videos (Martin's Mouthpiece and Competition Time). It's not too late to enter so watch the video's to find out what you need to do. Once I hit the magic 100, Youtube grants more tools for me to make better content. I will definitely be doing some more stuff on the short game, and the pitching challenges and add in some chipping challenges as well. I feel my swing needs one big fix, to flatten the shaft on the down swing and get it coming in at a better, more rotational angle. Get that right and I feel swing is going to be solid and repeatable.. After that, it's all things NLP and short game. So there you are, bang up to date again. I hope your own season has given you everything you wanted and if not that you've plans formulating to improve over the winter. Put a comment at the bottom of this blog and let me know how well you've done (or not) and what you're working on. I'd love to know if I'm alone in my never ending drive towards single figures and getting better. There is more to come on here and of course on the Youtube channel so stick around. Winter is definitely on the horizon. Where did that golfing season go?